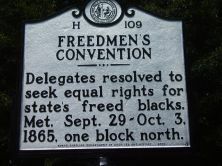 Delegates resolved to seek equal rights for state's freed blacks. Met, Sept. 29-Oct. 3, 1865, one block north. The Convention met on Friday last, and terminated its labors today, after a four days’ session. The sittings were held in the African Church of this city. It is a plain, white, wooden building, with floor accommodations for about 300 persons and gallery accommodations for about 100 more. Its floor is carpeted and its seats cushioned. The noticeable feature is a large and elegant and life-like plaster-of-Paris bust of Mr. Lincoln. James Walker Hood of New Bern was elected president. Hood stressed that “equal rights before the law” should be the convention’s watchwords. The delegates pressed for rights to testify in court, to serve as jurors, and to act as counsel but stopped short of endorsing Hood's suffrage proposal. “These are the rights we will contend for, these the rights we will have, God being out helper,” Hood concluded to applause. 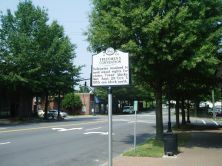 The church site was the northwest corner of Edenton and Harrington Streets. The congregation, established in 1849, has since 1884 been known as St. Paul’s African Methodist Episcopal Church. The original structure, shown on an 1872 map of the city, was in use until early in the twentieth century.